Mesothelioma immunotherapy treatments are producing good results for some mesothelioma patients and offering hope for many more. Research into new and better mesothelioma immunotherapy protocols is ongoing; there are a large number of clinical trials underway, with the promise of new treatments for mesothelioma patients. Several recent studies have focused attention on a tumor antigen called mesothelin that is found in mesothelioma and several other types of cancerous tumors. Mesothelin is a protein found in the genes of your mesothelial tissues. Mesothelium are the linings that protect your lungs and other organs inside your body. Mesothelioma is a cancer of these delicate membranes. Pleural mesothelioma attacks the pleura or the mesothelium around your lungs. Peritoneal mesothelioma affects the peritoneum, which is the mesothelium surrounding the organs of your abdomen. The cells of several types of cancer, including mesothelioma, also express or produce mesothelin (abbreviated to MSLN). Scientists don’t know exactly what function the mesothelin protein plays in normal cells. It is believed that the mesothelin found in cancer cells facilitates metastasis, or spread of cancer cells. Researchers have found that patients with higher concentrations of mesothelin in their tumors have reduced chances for survival. Although mesothelioma currently has no cure, doctors focus on preventing metastasis to prolong patients’ lives. Mesothelin is a tumor-specific antigen. This means that it is a substance that alerts the immune system to the presence of tumor cells. It is one of the only tumor antigens that is not also found in healthy tissue on your organs. This is significant for researchers working to develop new mesothelioma immunotherapy drugs, as well as treatments for other types of cancer. Because mesothelial tissues are not necessary to your survival and can be removed if needed, mesothelioma immunotherapy can target mesothelin without harming your vital organs. In fact, mesothelin could even be the key to the future development of a mesothelioma vaccine. It’s important to stop at this point in the story of mesothelin to give credit to an unsung hero in mesothelioma immunotherapy research. This hero isn’t a doctor or a researcher – it’s a mesothelioma patient family who chose to turn their misfortune into a way to help others. Gerald Boyd was exposed to toxic asbestos fibers through his father’s work clothes and later his own employment. When he developed mesothelioma in 2014, he took the corporations responsible for his asbestos exposure to court and hired Kazan Law to obtain justice. Mr. Boyd was diagnosed with Stage III mesothelioma. Patients diagnosed that far along generally aren’t able to have their tumors surgically removed. Surgery, combined with chemotherapy, is an effective way to increase survival time for some mesothelioma patients diagnosed at Stage I and II. A Stage III diagnosis can be a grim prognosis. The new mesothelioma immunotherapy drugs currently available and coming through the pipeline could change the outlook for late-stage mesothelioma patients like Mr. Boyd. His legacy is playing a part in the research that could help others in a similar situation. The Boyd Family Fund is part of the Kazan McClain Partners’ Foundation and is funded with money from Mr. Boyd’s settlements. Through our charitable foundation, the Boyd family has provided funding for clinical trials of mesothelioma immunotherapy drugs. This includes several mesothelioma clinical trials at the prestigious University of California San Francisco, near Mr. Boyd’s home. Some of the research funded by the Boyd Family Fund is looking at mesothelioma immunotherapy drugs that work by interacting with the mesothelin in tumor cells. Sadly, Gerald Boyd died from his mesothelioma in 2016. His legacy lives on, however, in his contribution to clinical trials that could change the lives of other mesothelioma patients. Mesothelioma immunotherapy drugs are often administered the same way as conventional chemotherapy drugs, either intravenously or orally, in extended doses taken once a week for several weeks. That’s where the similarity stops, however. Mesothelioma immunotherapy works on a different principle from mesothelioma chemotherapy. Immunotherapy treatments attempt to alter the mechanisms that promote cancer at the cellular level. They use a variety of proteins and other tiny cell components to activate the fiercest cancer fighter you have: your own immune system. Several mesothelioma immunotherapy drugs that target mesothelin are underway. The drug amatuximab may be useful when combined with traditional chemotherapy drugs (pemetrexed and cisplatin) as a first line treatment for patients who aren’t eligible for mesothelioma surgery. Amatuximab likes to bind with mesothelin and appears to be tolerated well in combination with chemotherapy drugs. Anetumab ravtansine, also known as BAY 94-9343, is being tested as a second line treatment. That mesothelioma clinical trial is comparing the mesothelioma immunotherapy treatment to a second line chemotherapy drug, vinorelbine. Researchers want to see if the immunotherapy drug will do a better job of preventing participants’ mesothelioma from progressing and spreading. A 2013 study of anti-mesothelin immunotoxins on mesothelioma patients included only a small group but some of them saw reductions in their cancer while taking the drug, or increased response to traditional chemotherapy drugs afterward. There are also numerous clinical studies relating to mesothelin as an agent of cancer spread in other forms of cancer. Though these studies aren’t directly looking at mesothelioma patients, they may produce new information that can benefit patients with several different cancer types, including mesothelioma. Many mesothelioma tumors produce large amounts of mesothelin. Those that do not express this protein may not benefit from mesothelin-based mesothelioma immunotherapy. The amatuximab and anetumab ravtansine studies are underway and not accepting new patients. However, there is another clinical trial relating to mesothelin, of a mesothelioma immunotherapy drug called LMB-100 that is accepting patients. LMB-100 is a protein that binds to mesothelin. After it attaches itself to this protein on tumor cells, it goes after the cancer cells and kills them. This mesothelioma clinical trial is seeking patients with pleural or peritoneal mesothelioma for whom platinum-based chemotherapy drugs like cisplatin have not worked. It’s a Phase I trial, which means that there won’t be a large number of participants. 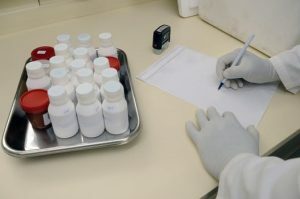 The researchers are primarily looking to find out the proper dose of this experimental mesothelioma immunotherapy drug. Are you interested in the LMB-100 clinical trial or another mesothelioma clinical trial? Go to Mesothelioma Circle’s free clinical trial tool to get more information and look for a clinical trial near you.